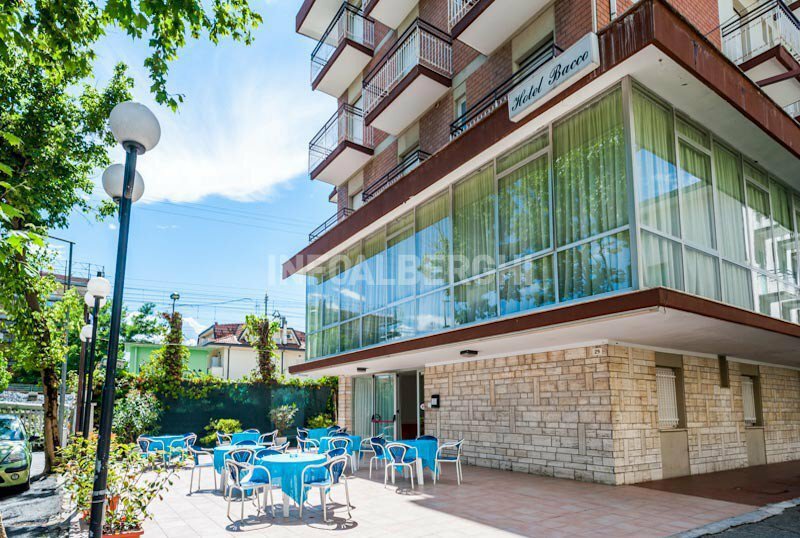 The Hotel Bacco is a two star hotel located in Rivazzurra di Rimini and has free parking, WI-FI connection, air conditioning and services for children. Pets are welcome. The hotel is located in Rivazzurra, a fraction of Rimini south, less than 5 minutes from the beach and the seafront promenade, not far from the theme park of Fiabilandia. Rivazzurra is well served by public transport linking it to both Rimini and Riccione. The rooms are all equipped with balcony, air conditioning, digital terrestrial TV, renovated bathroom with shower box, hairdryer (on request) and complimentary toiletries. Garden, bar, safe at reception, lift, reading room, theme nights. For a fee: bike rental. CONVENTIONS: beach, amusement parks, discos, waterslide. SERVICES FOR DISABLED: entrance on the ground floor, rooms with wheelchair maneuvering space and accessible bathroom with shower. LUNCH AND DINNER: guests can choose between 3 menus with meat, fish, Romagna specialties, homemade pasta, vegetable buffet, appetizers and appetizers. Water and wine with meals are included. VARIATIONS: On request: vegan, vegetarian and celiac. In hotel: indoor and outdoor playground area, pediatrician on request. The hotel has an agreement with the beach n. 107, equipped with a large playground area and inflatables, nursery, entertainment, playgrounds, disabled job chair, pet equipped area. Prices starting from € 29.00 per person per day! Contact us to request information! - special offer starting from € 29.00 person day!